I have always loved church conversions. Every time I pass one, or to be honest any time I see any sort of church that looks vaguely permanently inhabited, I stare really hard at it in a creepy fashion and probably scare the people who live inside. Whether you are religious or not, you have to admit there is something very cool about a church that has been turned into a home. 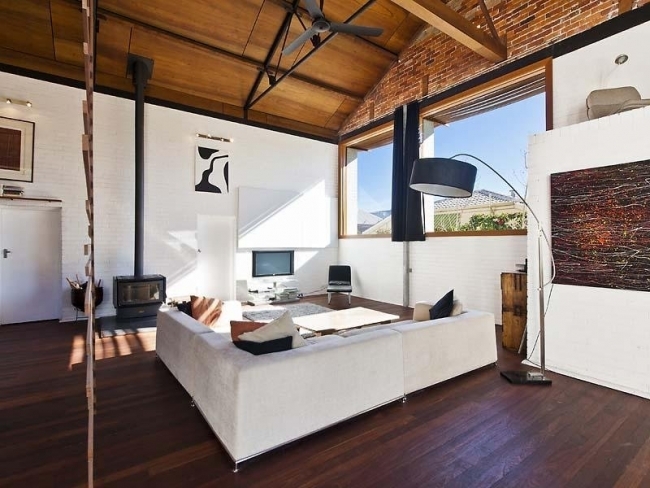 They usually have great architectural features like raking ceilings and beautiful windows, natural wow factor, plenty of street presence and so much space you can run through the house. I mean, I run through my non-church conversion house now but in a church conversion there's less chance you will thwock your hip on the dining table. 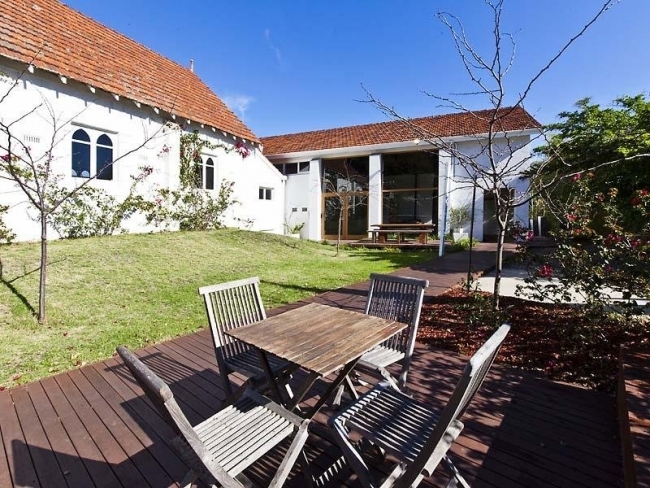 This church conversion in Mount Hawthorn has stacks of room for running (all up, just under 400sqm of living space - larger than a lot of blocks of land people build on in Perth these days!) and it is so big that once part of it was once used as a badminton court. And it's awesome. 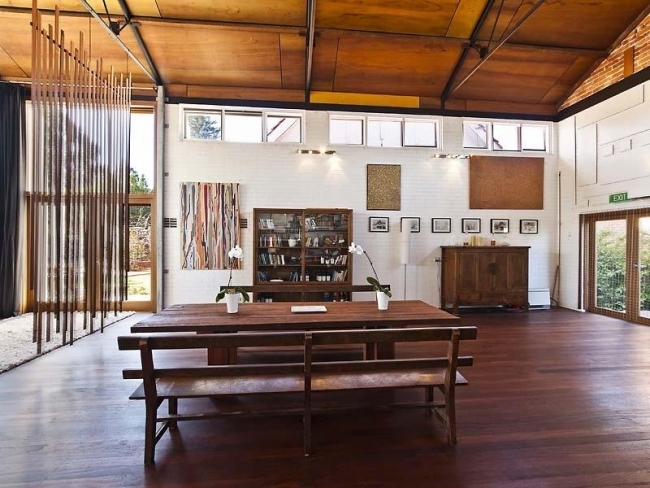 ABOVE: Once used for church functions and even as a badminton court, the church hall was been renovated to give it a gorgeous warehouse-style feel. The owner put in new windows to let in the northern light, but kept the old exit signs to the doors. 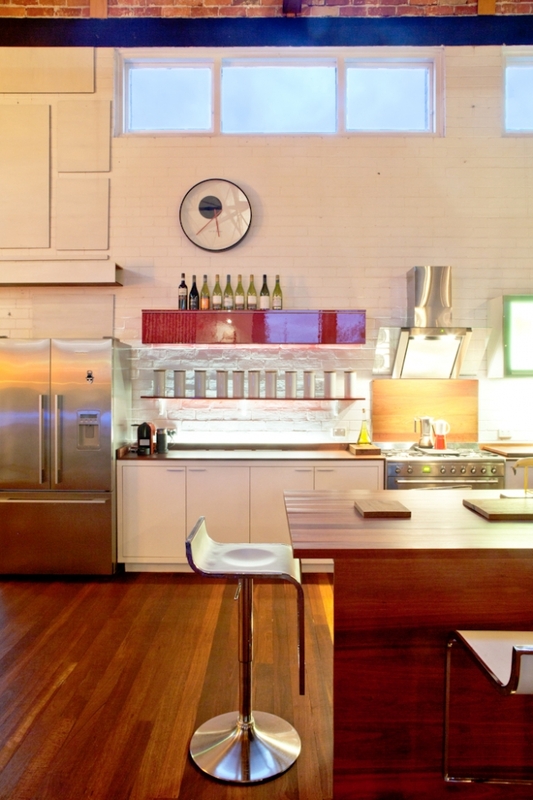 ABOVE: The hall kitchen. 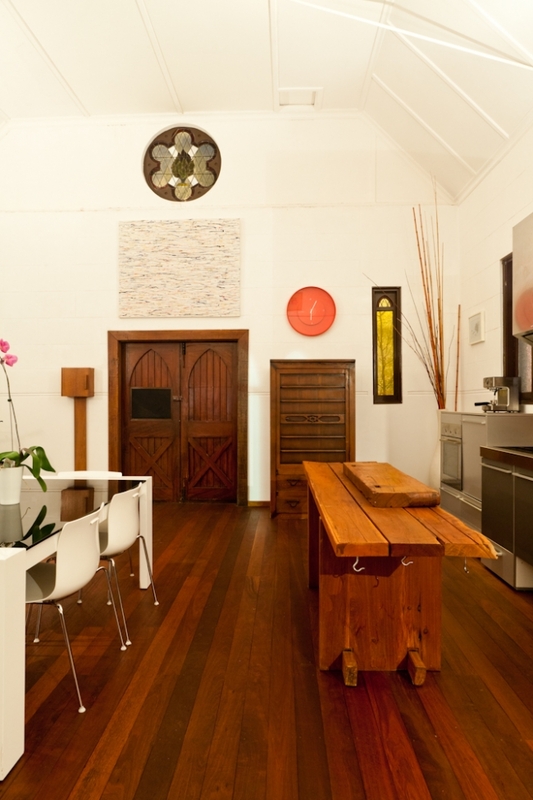 The owner built the island bench from jarrah. He had been searching for a ladder for the hall kitchen to hang above the island bench – then uncovered this one beneath the floorboards of the church! 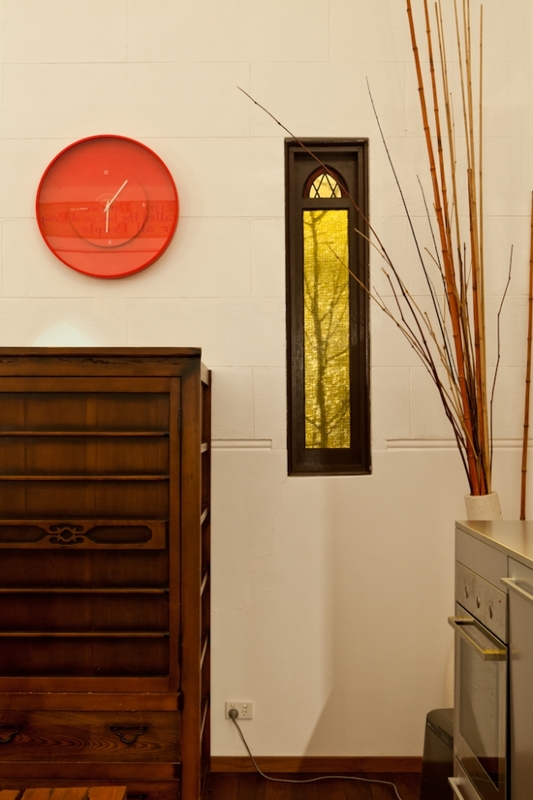 The 1930s church with pulpit, now a one-bedroom home. READING NOOK: Above the entry door to the hall home is still the original EXIT sign of the building. 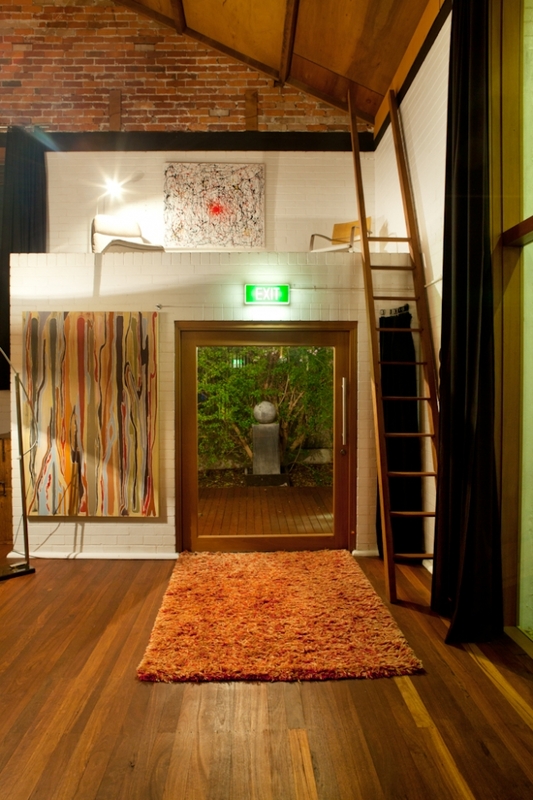 Above the entry to the hall is a raised area that the owner loves to use as a reading nook. It has a lovely outlook across the living areas of the hall. 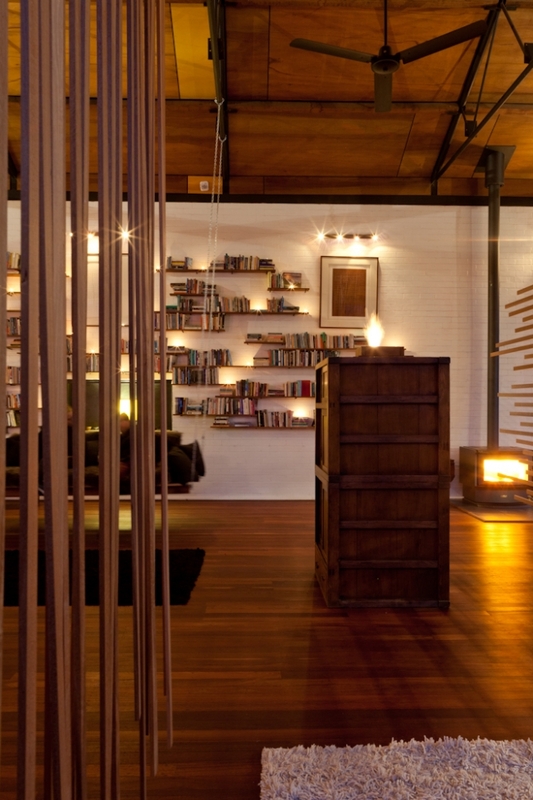 When my interior designer friend Nelly Reffet sent me a link to this place and told me it was right up my alley, she was right. I couldn't resist seeing if I could feature it on House Nerd! 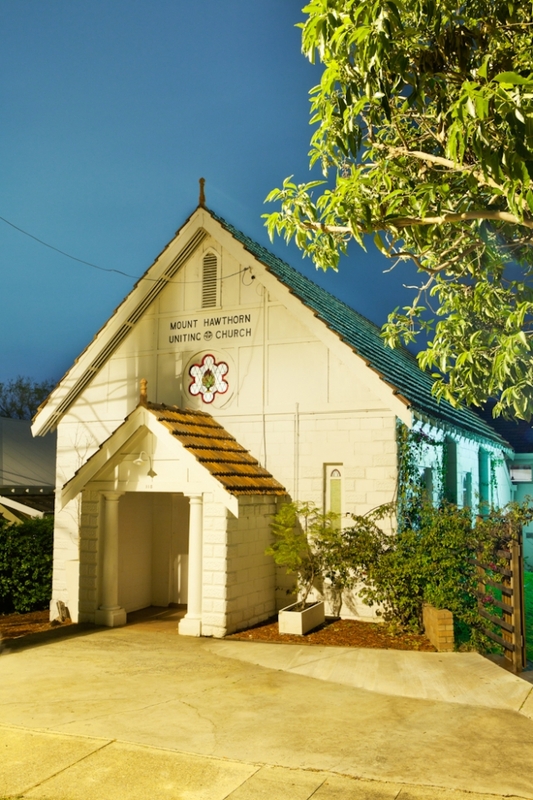 It is the heritage-listed Mount Hawthorn Uniting Church, built in 1937, and its adjoining hall. 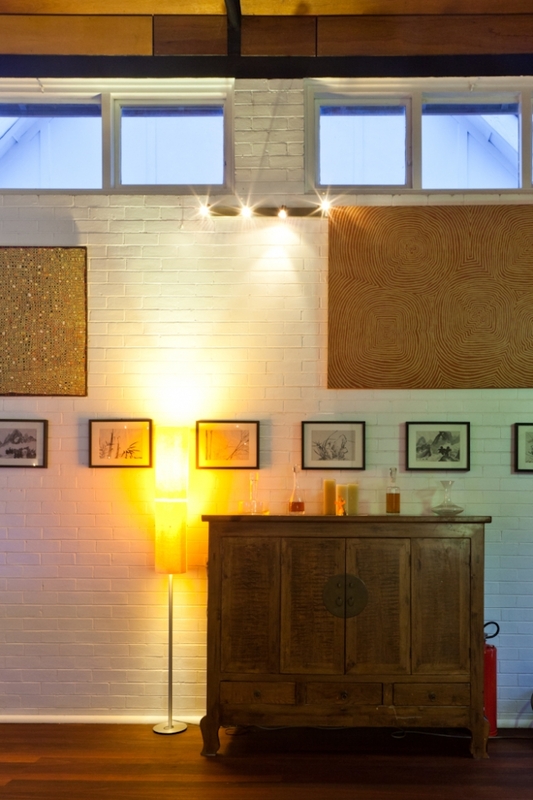 My photographer friend Heather Robbins and I visited it one bitingly cold winter’s evening, and while she shot her photos I had a nice chat with the owner, a philosopher and lecturer – who is an atheist! 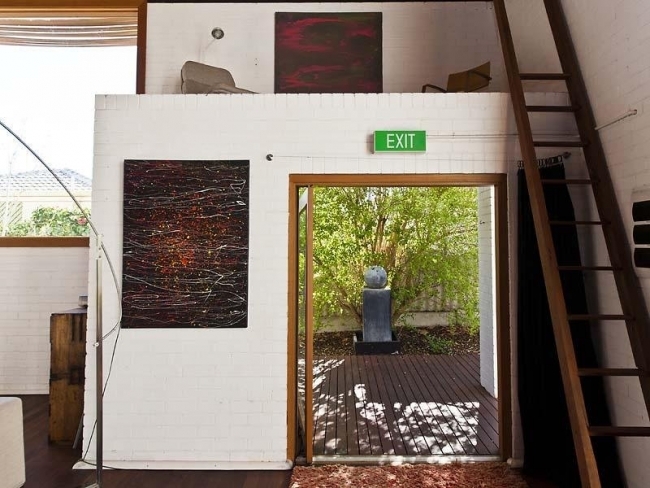 He bought the place in 2009 after seeing the place advertised for sale and despite having no religious leanings, he simply loved the feel of the space and could see the potential to turn it into a unique home. 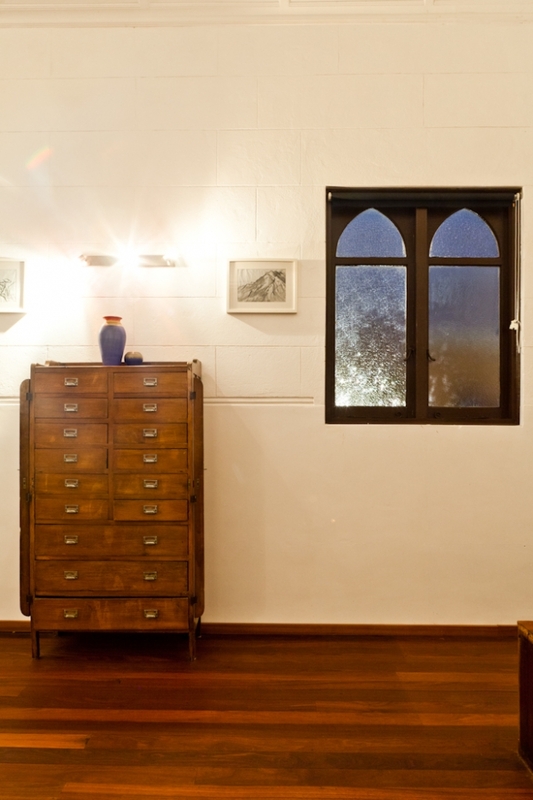 Since then he has carried out a full renovation, renovating the 1930s church first to turn it into a self-contained one bedroom home. He then lived in the church while conducting the rest of the renovation work to the 1970s hall over the next few years in between work and travel. 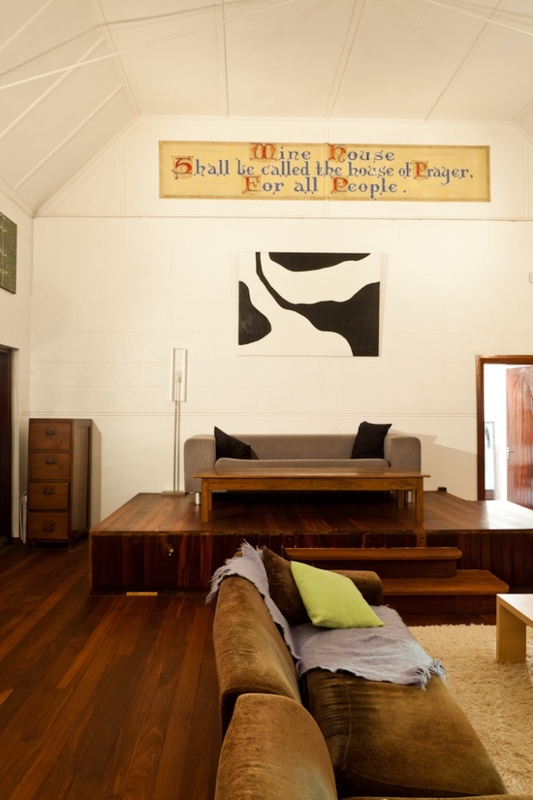 He has turned the 1970s hall into a huge, beautiful self-contained three bedroom, two bathroom home. The renovation work to this place has been extensive. 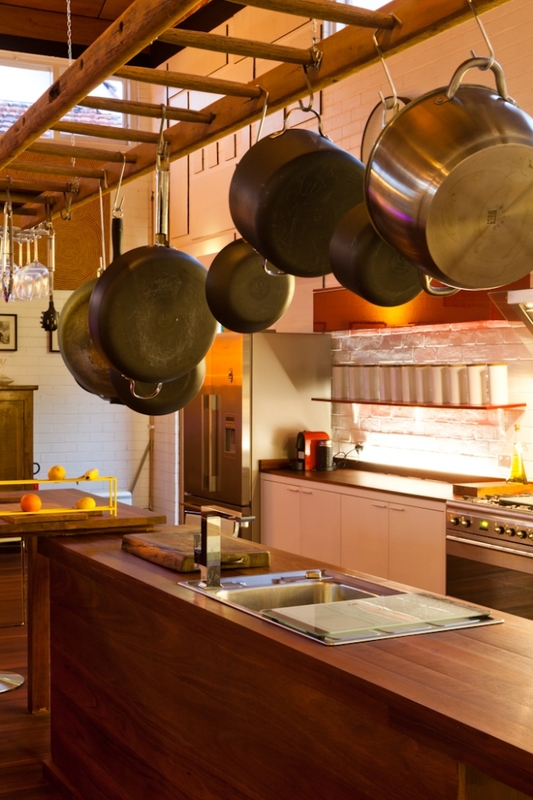 It involved adding two kitchens, three bathrooms, turning the old hall kitchen into a bedroom, sanding and oiling the original jarrah floorboards, and removing the old flat, low ceiling from the hall to make the most of the raking ceilings and the structural beams. The addition of huge north and east-facing windows help warm the living areas up during the day and even on a freezing cold winter's eve like when Heather and I are there, with the Norseman wood fire going the home sits at a comfy 22 degrees. 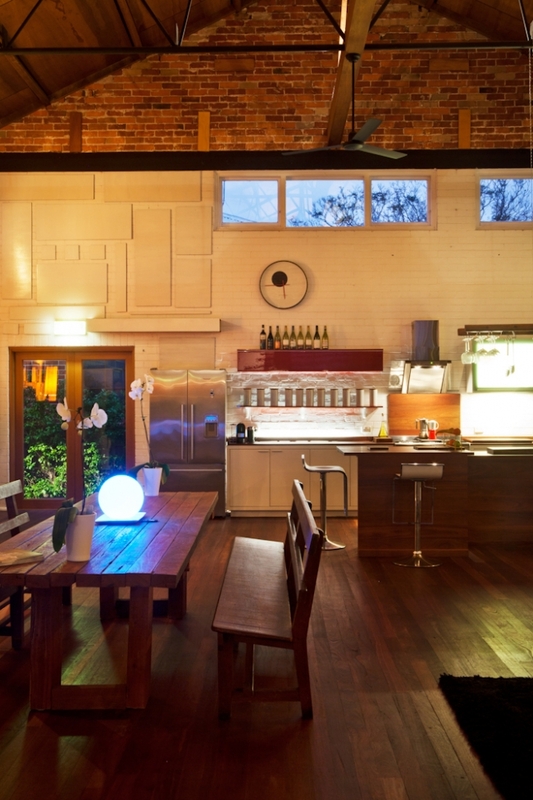 "Even though it's a big space, it is very warm," says the owner. In the day time, this home is sunny and light-filled at every turn. At night, it is atmospherically lit by feature lights, candles and fire rather than bright lighting, making it feel richly dramatic and completely different. 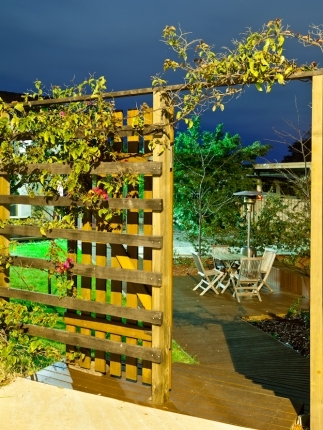 Night-time photography by Heather Robbins of Red Images Fine Photography. 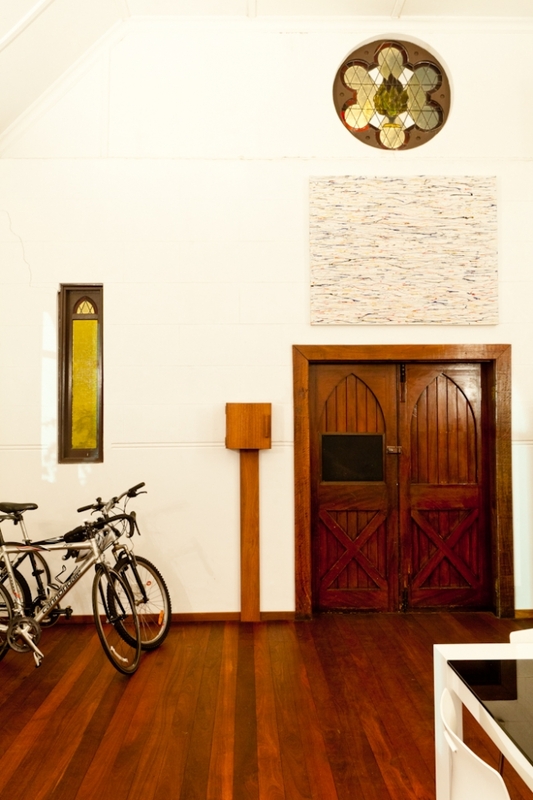 ABOVE: The heritage-listed church still has its original pulpit and sign. Night-time photography by Heather Robbins of Red Images Fine Photography. ABOVE: A tree casts a wintry silhouette on one of the church's original windows. In the day, the church and hall are light-filled and airy. 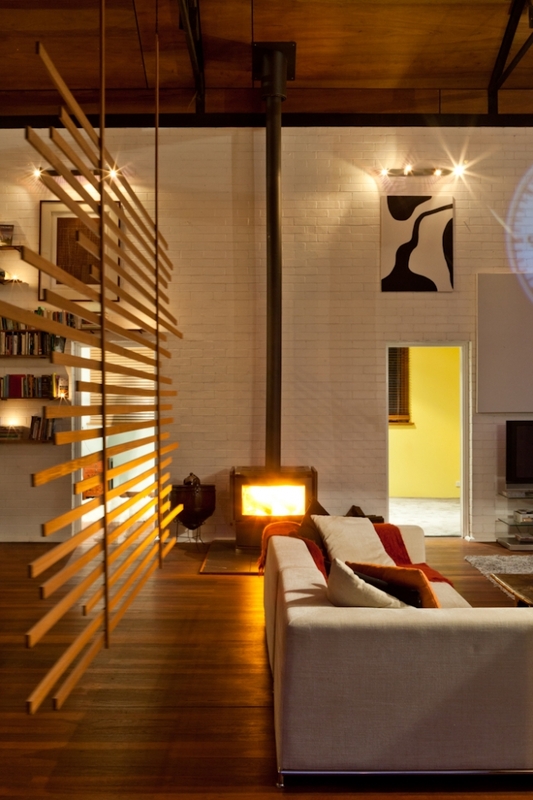 At night, this home feels completely different – rather than lighting up everything bright LED-style, the owner uses only feature lighting and candle light to add drama, draw attention to the high ceilings, brickwork and woodwork, and make the place atmospheric and cosy. Photos by Heather Robbins of Red Images Fine Photography. 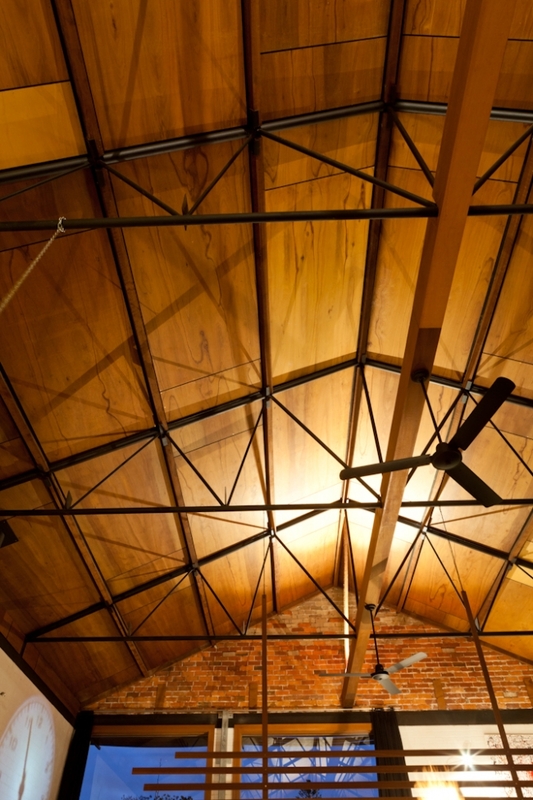 ABOVE: The owner pulled off the fake low ceiling to expose the gorgeous raking ceilings above. He panelled them with beautiful pieces of ply. Photo by Heather Robbins of Red Images Fine Photography. SURPRISE FIND: The owner had been searching for a ladder for the hall kitchen to hang above the island bench – then uncovered this one beneath the floorboards of the church! Photo by Heather Robbins of Red Images Fine Photography. The church came with 15 pews available - and beautiful ones! (I have looked for a church pew for our home on many an occasion, and trust me there are a lot of ugly, overpriced ones out there). 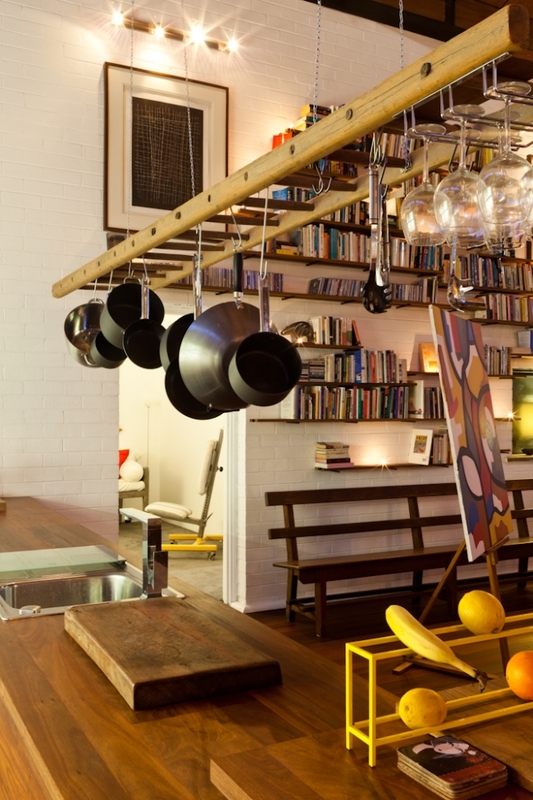 The owner used one for the dining table, and there is another underneath his awesome wall of books - the shelves which he made. At night, he lights up the shelves with candles. 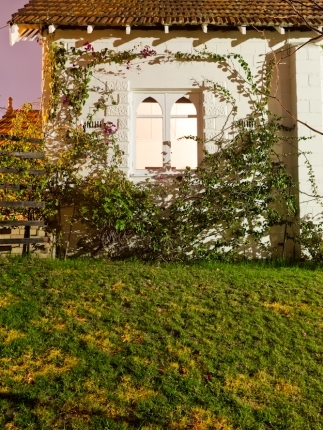 Night-time photography by Heather Robbins of Red Images Fine Photography. ABOVE: The church has its original Gothic windows. Photos by Heather Robbins of Red Images Fine Photography. 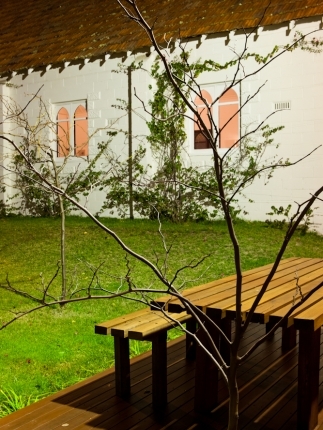 RECYCLED TIMBER: In the garden are Gleditsia trees and a fence the owner built entirely from wood found on verge collection. 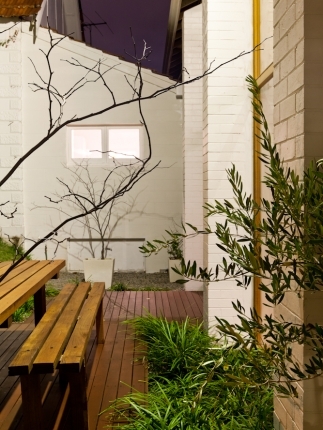 The owner built the outdoor dining table built from old timber ceiling joists. Photos Heather Robbins of Red Images Fine Photography. 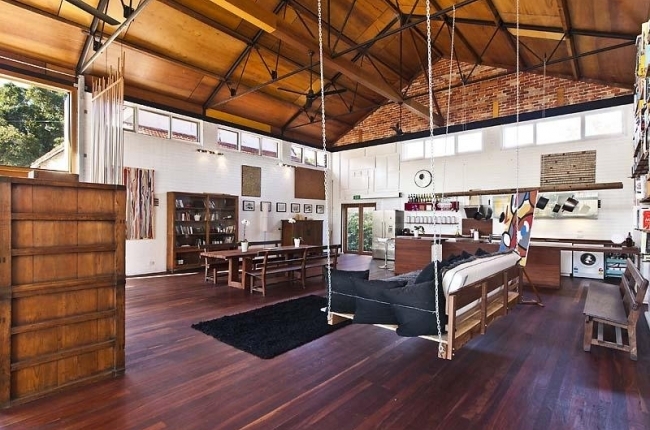 Many of the things in the home were made by the owner – like the giant, bed-sized swing by the church hall kitchen. Yes there is a swing in this house! 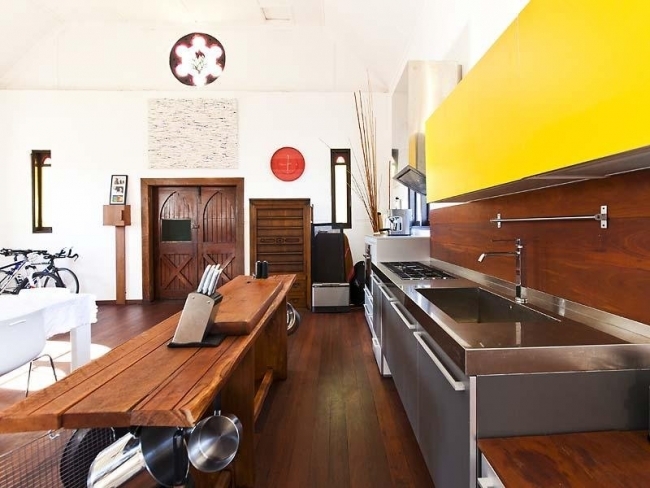 He also made the island bench in the hall kitchen out of jarrah, the timber screens that create ‘rooms’ in the vast open-plan space, the bookshelves covering the wall by the kitchen to house his extensive library (“I’m an academic – I have lots of books!”) and the handsome box around the freestanding methanol fire, made out of old Japanese teak. How do you feel about church conversions? Would you live in one? 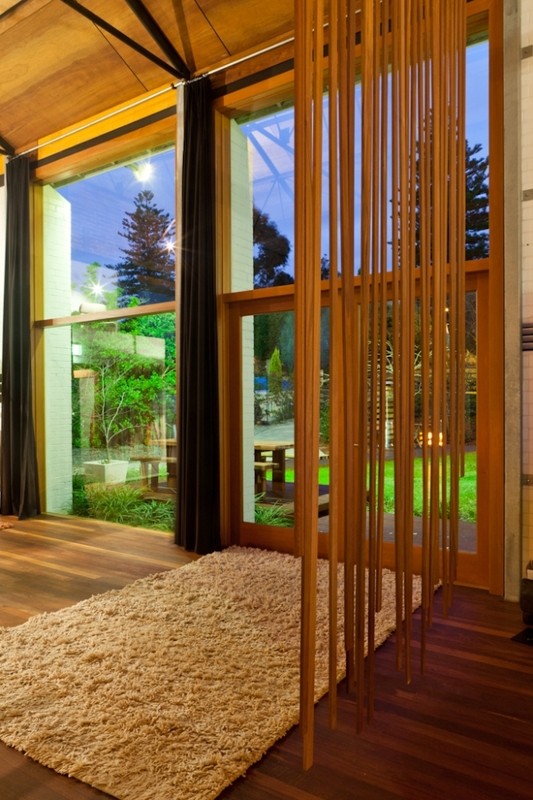 Would you love all the open space or would you feel like you're rattling around in such a large home? 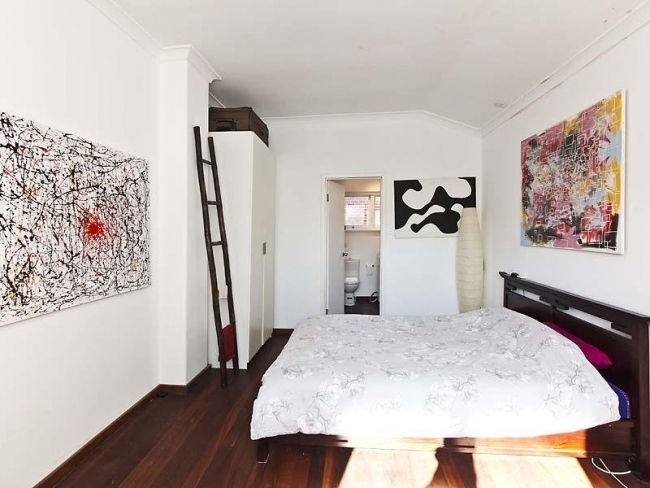 How would you use the space? 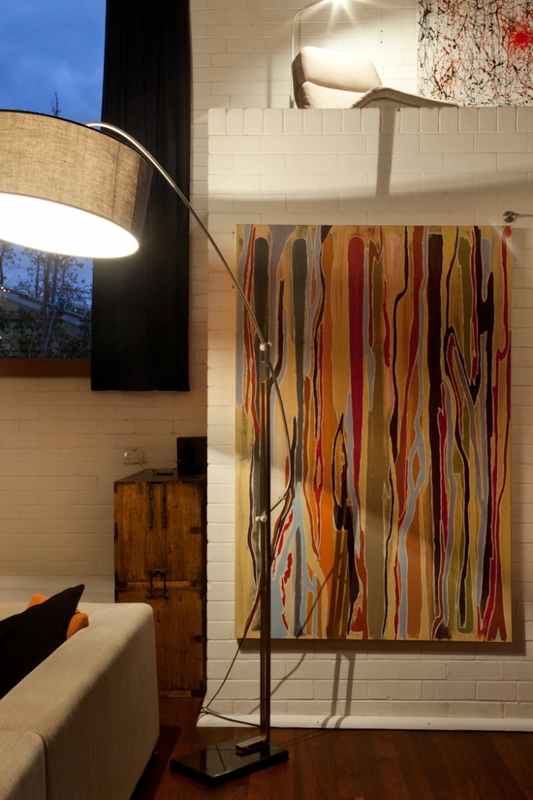 Although you know I love my smaller homes, I would wholeheartedly love to live in a church conversion and would use all the extra space to create a really wonderful home office and studio. 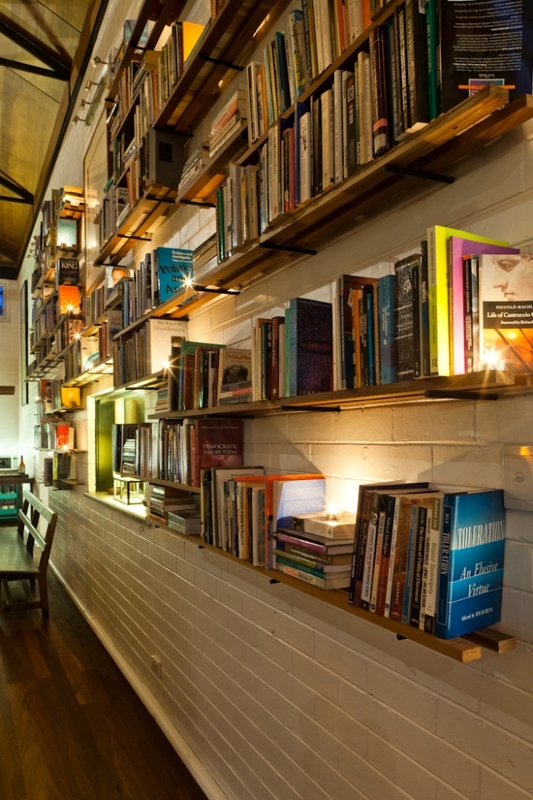 And I would get a scooter to whiz around and install a fireman's pole by the reading loft. The home is on the market with ACTON Central and goes to auction this Saturday, July 19th. 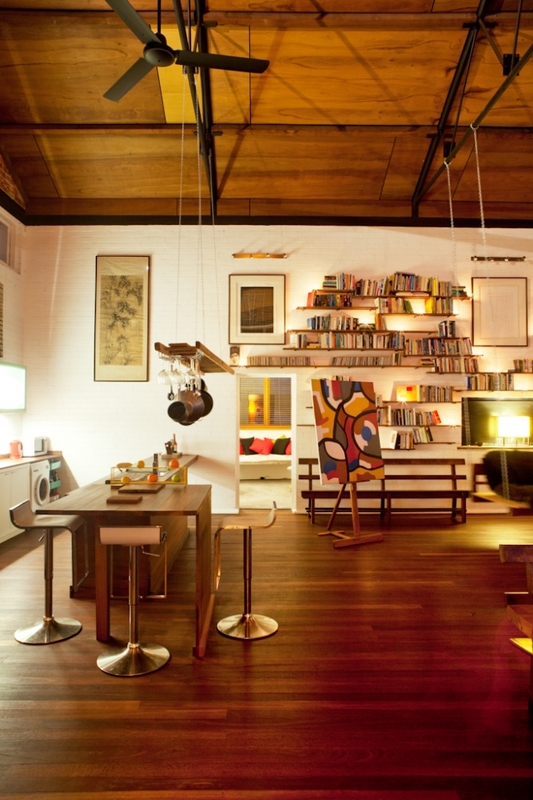 ABOVE: The reading loft overlooks the hall. The home is on the market with ACTON Central and goes to auction Saturday July 19th, 2014. OMG Drool! 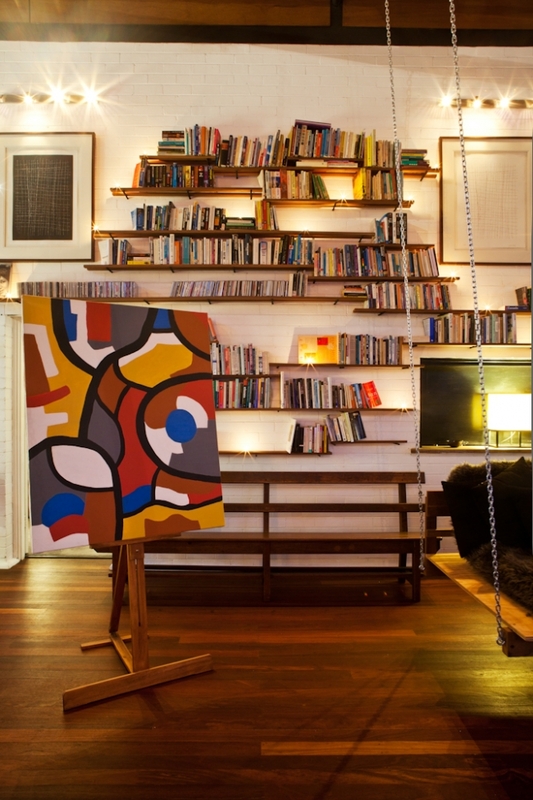 Everything about this is perfect, especially the reading nook and the whole wall of books! 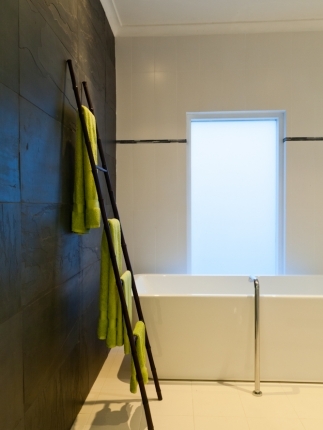 And the bath, but any bath that's big enough to fit all of me in is going to appeal. It's so cool huh? All beautifully done. 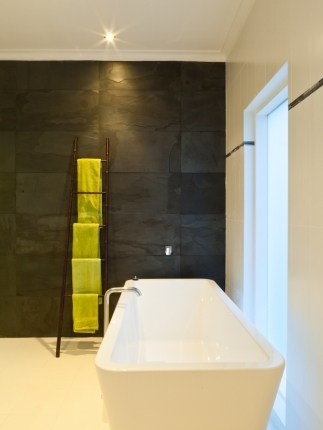 I love that bathroom - I love that he used black slate to the feature wall. People don't use slate enough - it's beautiful! 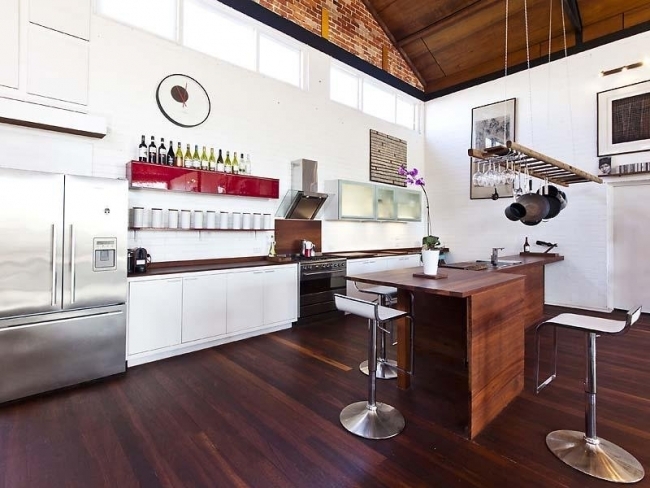 I think (and I know that this is a big call) that this might just be my favourite house, or at least one of. It looks so inviting - I'm getting warm fuzzies just looking at it! I think I know the one you mean! And I love it. I stare at that one every time - it's gorgeous. That is amazing. I used to walk past this church on my way to the bus every morning when we lived in Mt Hawthorn and always loved this place. Kudos to the owner for breathing new life into it. 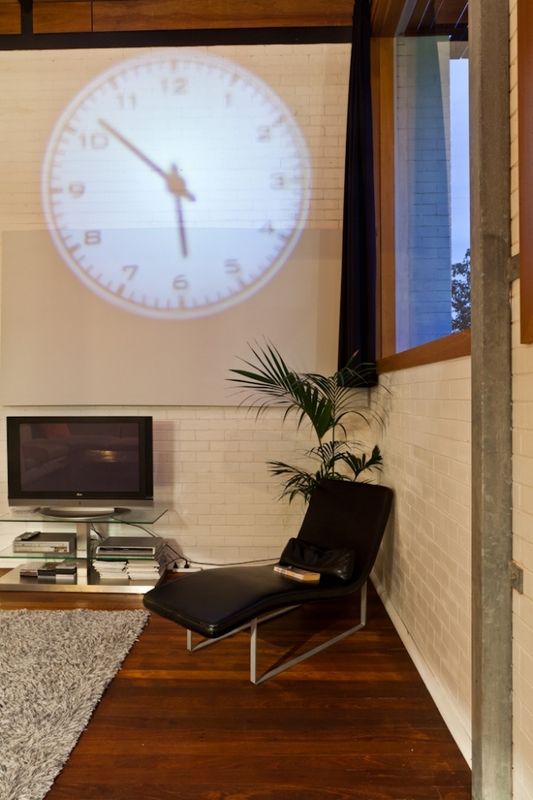 What an amazing renovation. Oh, it's heavenly! (That's an appropriate description since it's a church, no?) What I like most about it, aside from the beautiful furnishings (a combo of old and modern) is that although it is obviously quite large yet it feels cozy and intimate. 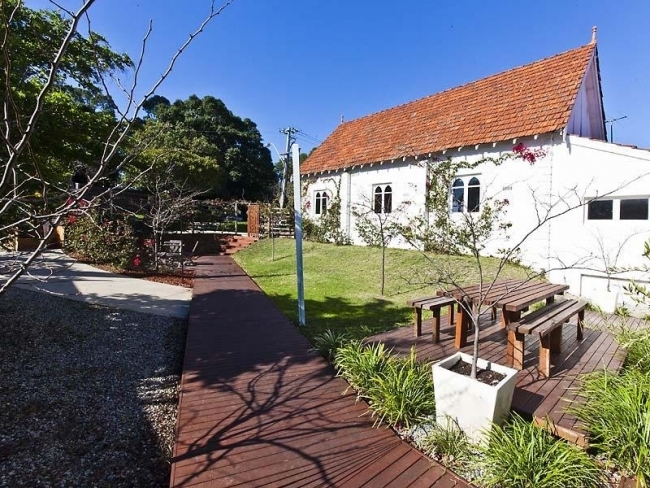 Now this is a church I could imagine myself living in (Maya, how many mils does one need to convert a cute lil' church in Australia?) 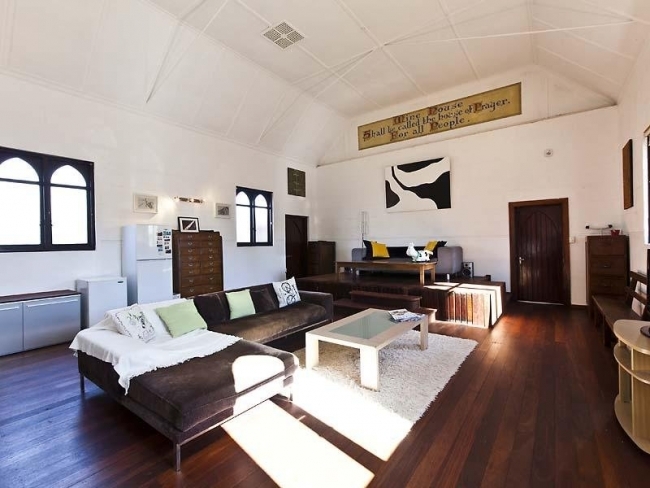 The church conversions that I typically see in North America are of churches of much bigger proportions (here is an example: http://www.apartmenttherapy.com/house-tour-197070#gallery/45555/5 ) and I cannot imagine feeling comfortable under such high ceilings. Not to mention that I would not want to cover the heating costs during Canadian winters. P.S. Heather takes such groovy photos! super-wow. 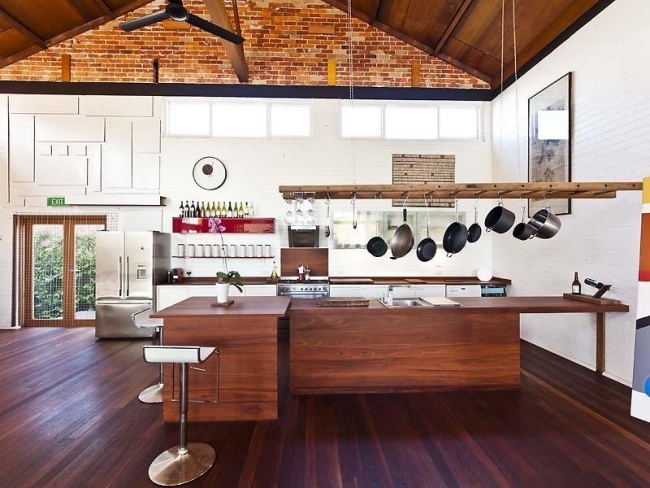 i love the use of white and wood. the restricted colour scheme is restful. 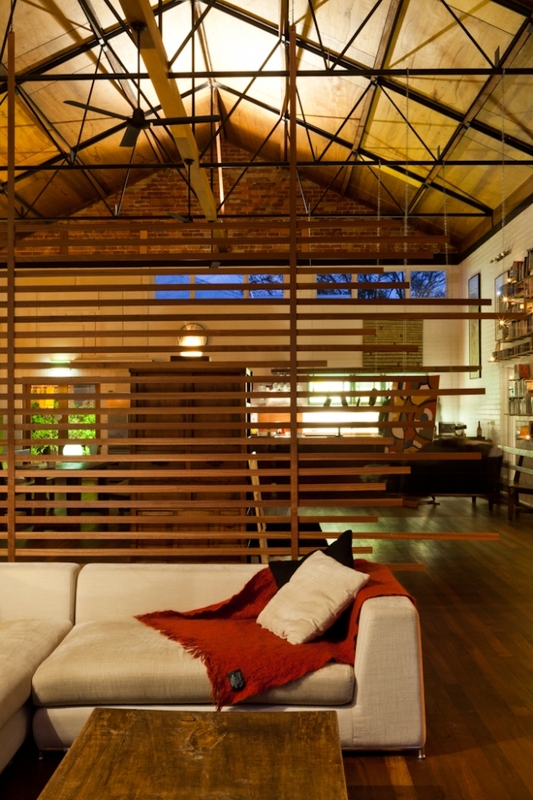 i esp love the room dividers made of hanging, uneven slats of wood. very funky without beign too try-hard trendy. WOAH!!!! WHAT A BEAUTIFUL PLACE!!! 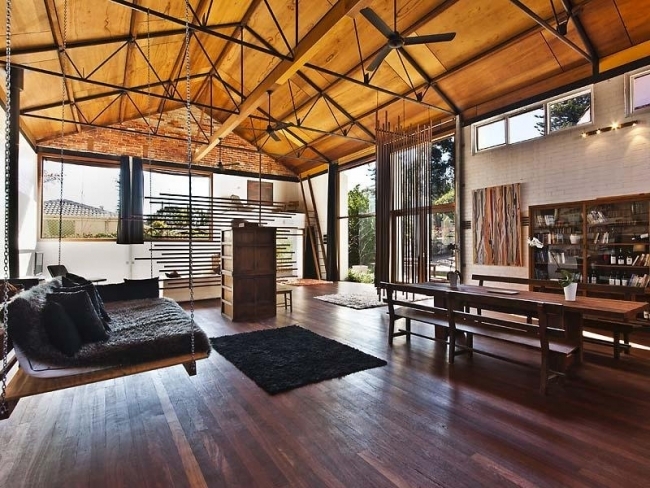 :O I'm in love with that swinging bed & the all the wooden things the owner has made! So so so beautiful. 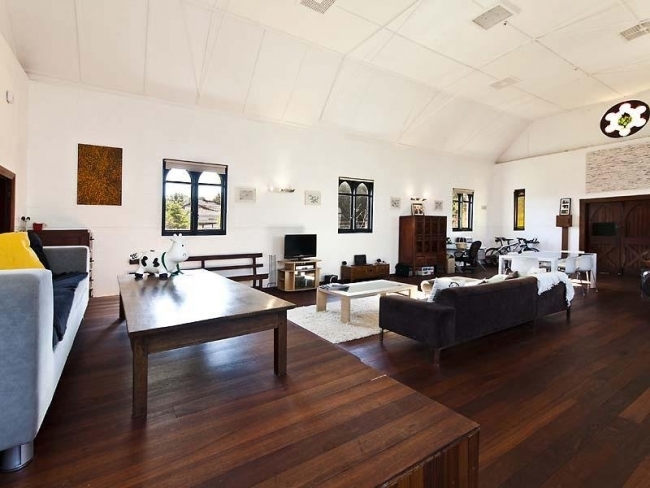 I would LOVE to live in a church conversion. I love the open spaces! I'm so glad you and Heather got here! It's brilliant to be able to experience it through your eyes and words. 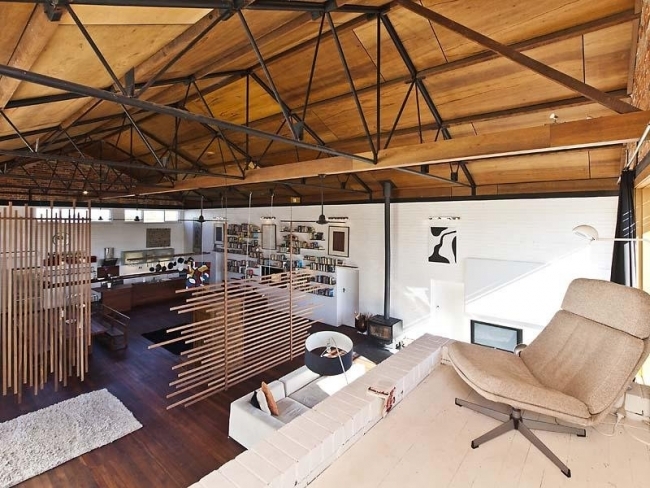 I'd live in a big space any day and this would do nicely thankyou very much - church or whatever. Wow!!!! I stumbled across this through you pinterest page. In LOVE!!!! 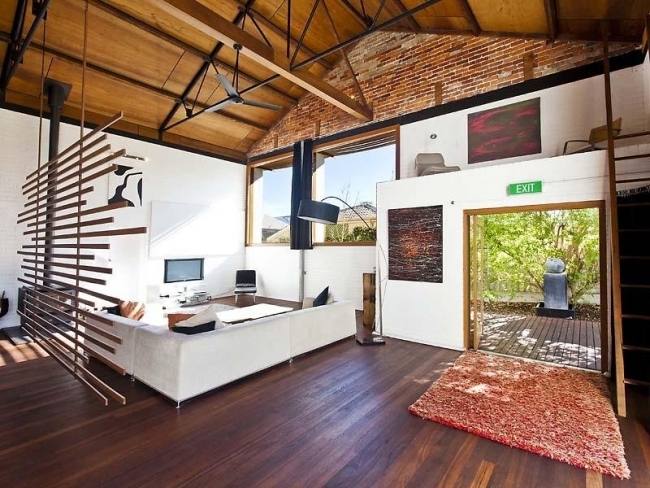 What an amazing space to live in. 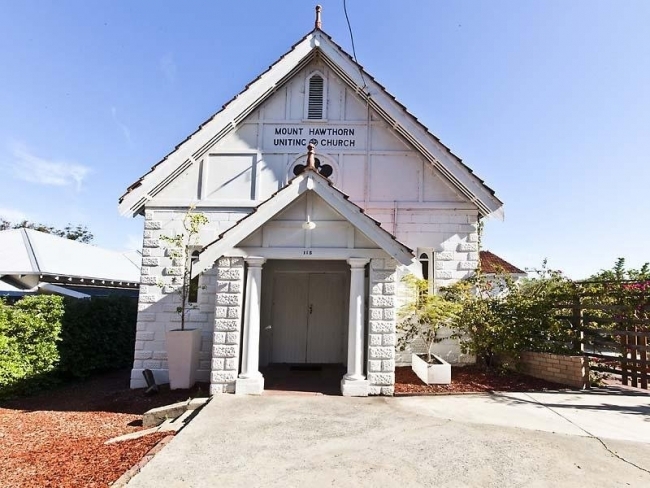 We are looking for a church building that we can use for worship services in the Cannington City or Gosnells City areas. Do you have anything to recommend? Thanks very much.